I'm a dreamer. I dream just anything and about everything. I guess, that's one attitude, i could not see changing. For me, sitting even just in front of our house looking at the moonlit with wishes to come true is one perfect solitary moments away from my busy and sometimes stress day. But that thought does not end there, as i enter my favorite place in our house which is my bathroom, i wanted to feel the same feeling of tranquility, that's why i make sure that i always a tea light on our bathroom but because of the problems and I am afraid of starting fire, i thought a nice tea light candles that are battery operated is more cool and less worrisome. 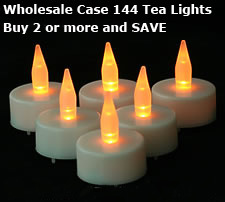 This battery operated lights used quality led lights , has no flame or smoke and looks really the same as the normal candle. What's good about it is I don't need to worry even if i forgot to close it because it would cause no harm to me and my home. I guess, it would also be a nice giveaway or gift to my relatives and friends or perhaps to a friend who is going to be married soon.